The other night my husband and I got in a heated debate about whether or not I'll earn how to ride a bike well enough not to be a safety hazard to all around me, or to invest in an adult tricycle. Our negotiation: I will ride my grown up big wheel with pride sans his wise cracks and he will go to Burning Man next year sans my eye-rolling. Honestly, I can't think of anything more horrifying than accidentally inhaling some sort of psychedelic and having sweaty, mask wearing, nouveau hippies offering me a free hug. So, despite the artistic freedom and fantastical fashion at the desert festival, I won't be joining him. 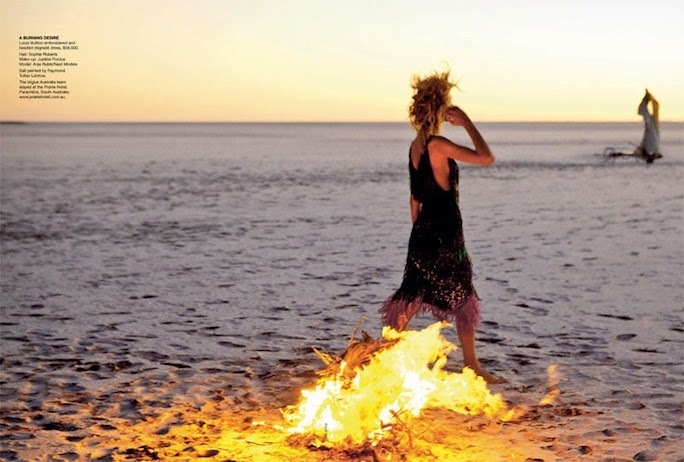 In honor of Burning Man, I'm sharing this beautiful burner-esque fashion editorial of Anja Rubik for Vogue Australia. Anja Rubik for Vogue Australia, April 2011 by Max Doyle. Love this editorial! So stunning. Stunning images....thanks for sharing Chelsea!! !